Merry Christmas Eve to all you amazing Team Stryker fans! I hope everyone is already for the holidays and are staying warm on this chilly day. I was hoping to have time to do a Team Stryker Christmas card but between the day job, finishing Mission 004 and general holiday craziness I just couldn’t find the time. Let me know in the comments or on Facebook or Twitter if you would like to see one and I’ll do my best to make one even if it doesn’t come out on Christmas. One of the few faults of having such a detailed webcomic is that even little projects like a Christmas card would require a ton of time and effort. I wouldn’t want to give you anything less than a picture worthy of the Team Stryker name. 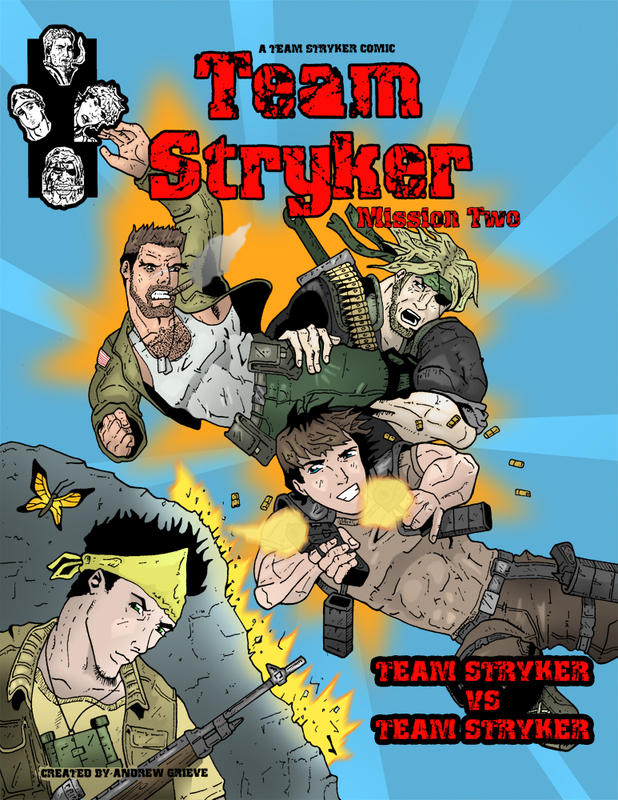 For your Christmas Eve present I thought I would share with you what the cover to Team Stryker Mission 002 looked like back in 2008. There is a much greater leap in quality compared to Mission 001 as I had some practice between the covers but it is still simpler compared to the final version. Besides just a better understanding of Photoshop and coloring in general there are some subtle character changes between 2008 and now. Casanova used to have brown hair and has since become a free loving blonde. Since Casanova is (loosely) based off myself he had my hair color back then but when I went back and recolored these pages I discovered he looks much better as a tanned blonde. Hopefully you all agree that these changes have been for the best. I hope everyone has a fantastic holiday and I can’t wait to continue on this adventure with all of you in the new year. We have just one more week of retro look backs before Mission 003 continues on January 3,2013!